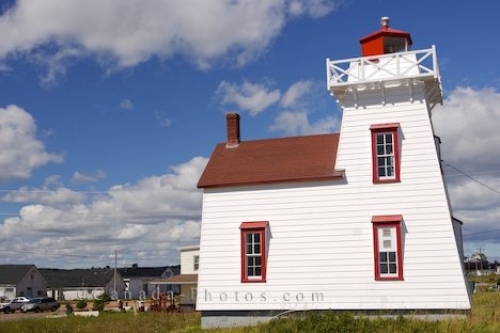 The North Rustico Lighthouse in Prince Edward Island, Canada is painted white with red trim around the windows and is very well maintained. This lighthouse was first established in 1876 and sits amongst the many buildings that make up the town of North Rustico. North Rustico Lighthouse in the town of North Rustico, North Rustico Harbour, Gulf of St Lawrence, Highway 6, Blue Heron Coastal Drive, Queens, Prince Edward Island, Canada. Picture of the North Rustico Lighthouse in the small town of North Rustico in Prince Edward Island, Canada.